pseudoparanormal: Orbs--paranormal or easily explained? One question that always sparks some interest as well as debate is the existence of orbs. While there are many believers to the theory that orbs resemble a doorway into the unknown, skeptics maintain that orbs have nothing at all to do with the paranormal. Although much has been written both for and against the existence of orbs, there are still many unanswered questions as to what exactly orbs are and whether or not they actually exist. At http://ghoststudy.com/main/fakepageorbs.html, which is based in Sacramento, California, these advocates do their best at explaining the reasons behind the life of orbs. Orbs are described as being fast moving, floating balls of light; the light ranges in strength of its luminescence as well as its size. 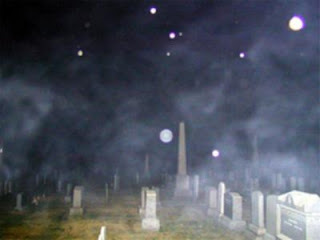 The orbs are believed to be either spirits of the deceased or a whole separate life form. Although these advocates recognize the fact that many of the so-called orbs seen in pictures, for instance, can be explained as being false-positives, they give several tell-tale signs that prove their existence. When viewing a photograph, one should look for a bright, vibrating ball of light; apparently, these are more likely to be real than faded ones. The less the amount of orbs, the better; multiple “orbs” in a photo can usually be better explained as dust motes. Also, when looking into the authenticity of orbs, another key element is usually whether or not the orb leaves a slight trail within the photograph. The other take on orbs is that not only are they not paranormal, but they are also nonexistent and can, in fact, easily be explained. Troy Taylor, a skeptic who is both the author of the “Ghost Hunter’s Guidebook” as well as the president of the American Ghost Society, has an entire webpage dedicated to disproving the life of orbs. He has done several studies on the existence of orbs and has reported both his findings and views online. At http://www.prairieghosts.com/trouble.html, Taylor begins by saying that orbs are not unexplained phenomena. Before the existence of digital cameras, orbs were virtually unheard of. He believes that a majority orbs can be seen with the naked eye, and when they do apparently show up in photographs, it can usually be blamed on either having been taken by low resolution, low pixel cameras or as a result of a refraction of light from the camera lens. He also gives examples of many semi-microscopic particles that can cause these so-called orbs to appear, including dust, moisture, and hair, just to name a few. Taylor also maintains that although there are pictures containing orbs that have been taken at haunted places, they show up literally all over the place. In close, the existence of orbs cannot be entirely discounted. After doing some research on this topic, both the advocates and skeptics of these floating balls of light make valid points on their existence and nonexistence. And although many of these so-called orbs that appear in photographs are easily explained by something else, as a believer in paranormal activity, and a possessor of some of these photographs, there is always room left for the unexplainable. I had a friend who put together a "Ghost Hunting" group about two years ago, armed with her digital camera she posted her orb-covered pictures on Myspace. I often wondered if there could be any legitimacy to it but I had never really given much thought to when the whole orb phenomena started. I think it's interesting that Taylor seems to cite it as a pretty recent form of proof for ghost hunters along with the emergence of the digital camera. The weird thing about orbs is that I've never seen any sort of consensus as to what the hell they even are. Some people believe that they're actual spirits, while other people believe that they're some kind of residual effect from a spirit's presence. It doesn't really matter, I suppose, but funny story: my mom still has a 35mm film camera that she uses, and I've seen orbs show up in pictures from that. Not that I'm saying that these things are actually ghosts, but the fact that they do show up in photos other than digital ones is something to think about.